This list is generated by our servers automatically. Based on data from 3/19/2019 to 4/18/2019. Strapless Short Geometric Sequins Pattern Party Prom Dress. Sequins in silver & light gold make different geometric designs at bust, waist & skirt. Sweetheart neck dress is padded at bust with back zipper closure. Imported. 2 piece pant dress has an embellished neckline, Top has a multi color metallic texture and an asymmetric hemline. Back of top has wide straps and a zipper closure. Pants have an elastic waist and are wide leg. Matching scarf included. Made in USA. Lace 3/4 sleeve evening gown in a relaxed style with a crew neck. This evening gown features a low back, an a-line silhouette and pleated detailing. Back zipper closure. Collared Full Sleeves Sheer Short Jacket with Beading. Artistic beaded stems with silver thread leaves pattern all over the jacket including sleeves, collar & back of jacket. Double hook closure & shoulder padded. 100% silk chiffon jacket is 26" long approx. Imported. Can be teamed up with dress pants or casual jeans at night. Full Sleeves Long Sequined Formal Gown with Keyhole Back. Exquisite leaves pattern in sequins all over the bodice in front & back as well. Full sheer sleeves & big keyhole at back. Long slit at the back & zipper closure also. Natural silk (100%) chiffon hand-beaded dress with polyester lining. Imported. Fully beaded formal gown with beaded upper torso and a front slit. See-through closed zipper back and see-through neckline. Spaghetti strapped v-neck dress with flower print swirls beading. Beading along top and bottom seam. Dress semi-transparent; recommend using a slip underneath dress. 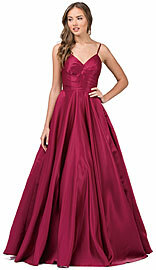 Off shoulder fitted prom gown with flared skirt. Features back zipper closure. Round Collar Neck Embellished Bodice Long Prom Pageant Dress. Sleeveless floor length dress has an intricate pattern at the bodice in beads & lace. Fitted bodice has racer back with sheer mesh panel & zipper closure. Small train at the back too. Imported. V Neck vines pattern tulle prom gown. Features exquisite and elegant pattern. Features back zipper closure.